You have only one certificate in your profile right now. In order for other people to send you secure message, they need to have your public key (certificate). 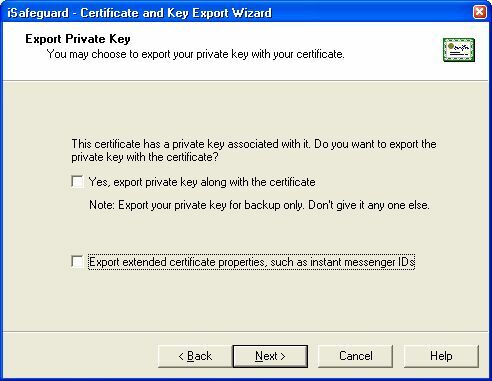 You have two options to export and share your public key (certificate). Use the context menu in iSafeguard Certificate Manager. Click here to learn more. Drag a certificate from the Certificate Manager and drop it to your email program. Click here to learn more. 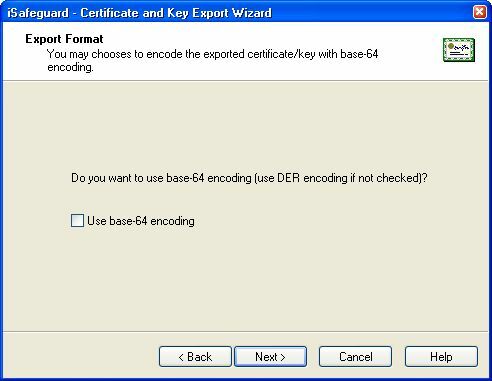 The first option is the easiest way to export your certificate. However you can only export the certificate only; you can neither export your private key nor the extended properties. 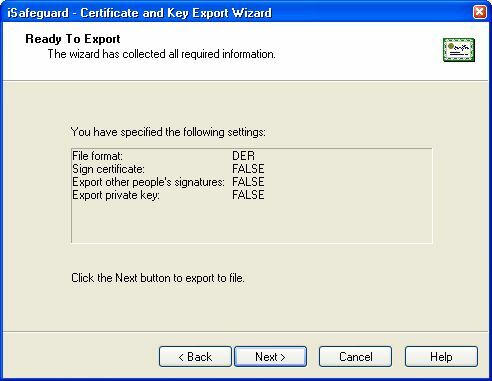 The wizard gives you more control over how and what to export. 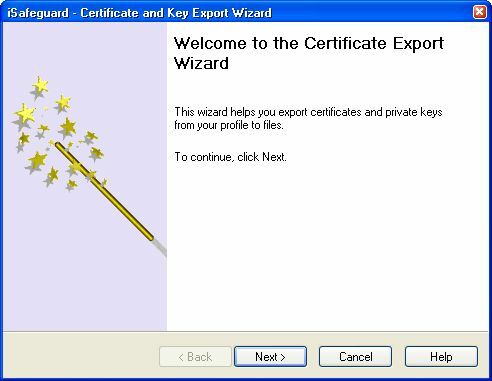 Here we are going to use the wizard to export your certificate. 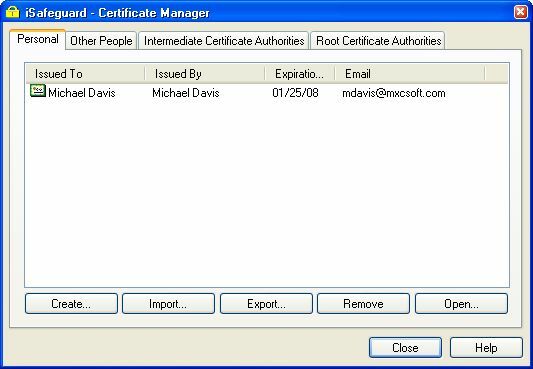 Close the certificate detail view window to return to the Certificate Manger. If you need help launching the Certificate Manager refer to User Manual: The Certificate Manager. 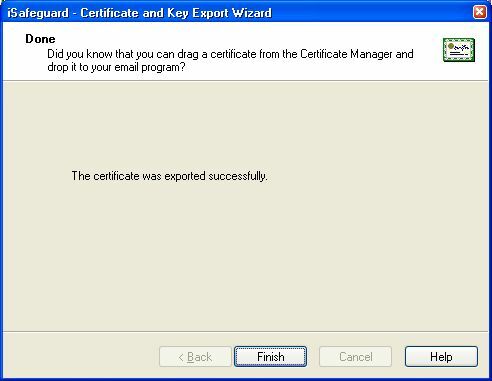 The certificate export wizard is shown as follows. Upon clicking on the Next button the following screen is shown to ask you if you want to export your private key. The following screen is shown to ask you if you to choose a file name. Click the Done button to complete the export. 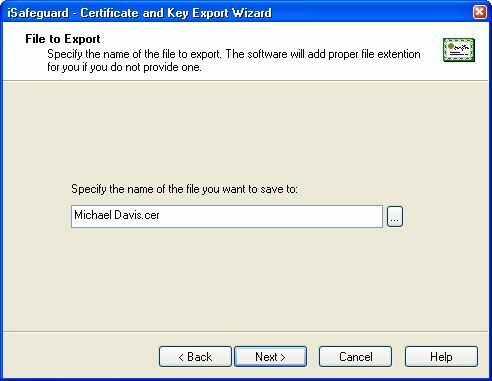 Now your certificate (public key) has been exported to a file named Michael Davis.cer. Now you can give the file Michael Davis.cer to your friends in a floppy disk or email to them. Your friend can then import your certificate into iSafeguard™. With your certificate, they can encrypt files and email messages that can only be decrypted by you with your private key.